Solar panels are often touted, nowadays, as one of the major solutions to our environmental and energy crises. Unlike conventional fossil fuel based means of generating energy, solar panels are completely free of harmful carbon dioxide emissions; they convert clean, pure sunlight directly into electricity that can be utilized by our homes and businesses. All that they require is plentiful exposure to the sun’s warming rays. Yet despite all the recent advancements in solar panel technology and efficiency, when the rain clouds come in, they remain just as useless as they ever have. But wait! That could soon change. We could soon have hybrid solar panels that harvest energy both from the sun and from the rain. Read on to find out more. 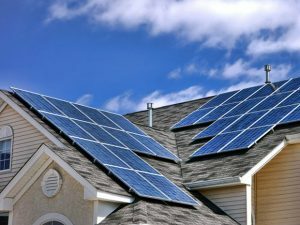 Solar panels are made up of many individuals but interconnected cells known as photovoltaic cells. Each cell consists of two layers of semi-conducting material – generally silicon – and other materials which give one layer of the material a positive charge, and the other a negative charge. This creates an electric field between the two layers, ie it enables current to flow through the cell. This is how a solar panel works: packets of energy from the sun’s rays, known as photons, hit the solar panel, knocking loose electrons from the surface of the semiconducting material, and causing them to migrate to the positively charged pole of each cell. Thus electricity is created – and via a series of conductive metal plates situated at the sides of the cell, which collect the incoming electrons and transfer them to conventional wires – made usable in our homes and businesses. Solar technology is constantly evolving, so that solar panels are expected to become even more efficient, lightweight and flexible in the years ahead. Some experts predict that within a few years solar cells will become small enough that they can be integrated into our architecture, smartphones, and watches, and even be used to create wearable electronics. Aside from solar PVC panels, there are other forms of solar technology as well – such as concentrated solar power (CSP) and solar thermal devices. Though somewhat different from PVC cells, they also work by harnessing the energy of the sun to generate electricity or heat hot water. Solar panels that harvest energy from the rain? No matter how impressive the development in solar panel technology over the years, even the best solar panel in the world is still completely reliant on access to direct sunlight, and is next to useless on a rainy, overcast day. Or so we thought! 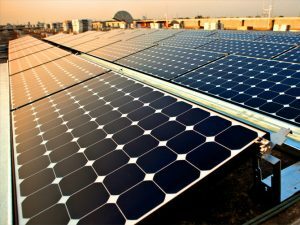 According to some researchers, soon we may have solar panels that can harvest energy both from the sun and the rain and will be able to power our homes under all conditions. According to researchers at the Soochow University in China, the key component of these ‘hybrid’ solar panels is a TENG, or triboelectric nanogenerator, a device that, like static electricity, generates an electric charge from the rubbing together of two materials. TENGs can apparently generate electricity from car tires dragging along the road, clothing fabrics rubbing up against one another, or in our case – the motion of raindrops hitting a solar panel. The end result is a solar panel ‘for all seasons’, one that operates come rain, hail or shine. Though the idea of using TENGS in this manner is not entirely new, the challenge up until now has been to invent a system that isn’t too cumbersome or complicated. In the device created by the scientists at Soochow University, a pair of polymer layers were used to build a TENG that can be placed on the top of a PV cell. The researchers also used imprints from DVD discs – the same kind that you use to watch movies in your home – to add grooves to one of the polymers in order to enhance its energy gathering efficiency. In lab experiments, these textured polymer slices functioned as an electrode both for the TENG and for the solar panel underneath it, so that when raindrops hit the TENG the layers came into contact, and electricity was conducted between the two different devices. As the polymer layers are transparent, sunlight can still be captured by them as well, though not nearly as effective as the PV panels underneath. The basic concept behind the device is certainly sound, but the next challenge is to increase the quantity of electricity that can be generated by them to make this a commercially viable prospect. But, for now, maybe it is enough that the idea has been proven – the fact that it has been shown that we can harvest even a very miniscule amount of electricity from falling raindrops alone is a very important development. As mentioned, scientists have been trying to do for a long time. In 2016, researchers at the Ocean University in China succeeded in generating electricity from the rain falling on top of solar panels by placing an extra, graphene material layer on top of the panel. The scientists, by separating out the positively charged ions in the salty rain, then got them to bind to the graphene, which was then able to function as a pseudo-capacitor – basically, a device consisting of two layers, each with different energy levels, that can then generate an electric current. As in the present research though, the major challenge was ‘upscaling’ the technology so that it can generate sufficient electricity to be commercially viable. Still, here is another example of a solar panel that can run on something other than solar input! Perhaps the key virtue of these hybrid solar panels is that it rains at night! So one day in the not too distant future we might be able to witness solar farms that generate electricity 24/7 and in all weather. That would definitely be something to get excited about, and would certainly enhance the prospects of renewable energy. See here to read more. Next story Do solar panels produce toxic waste?